Union Offers Peace Accord to Quest Management! Quest staff have in a recent survey told us what to do. 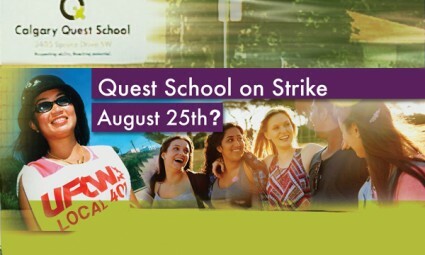 Eighty percent or more of responding Quest staff have told us that a strike vote is important! But that same eighty percent has also told us to ask for binding arbitration from the Employer as a means of solving this matter. Just after 3:00 p.m. today, we sent the following letter to Angela Rooke, Jesse Hogan, and their lawyer Erin Ludwig. It is self-explanatory. Please read it as it reflects your wishes. For binding arbitration to occur, the Employer must agree. We cannot demand it. For there to be peace, they must want to have peace. The strike vote process will continue in the meantime. But we know that you share our hope for a “softened” approach to this situation. While we are waiting, it is important that we still carry our “big stick.” Unfortunately, this still appears to be necessary given the realities of Quest management’s structure and perspective. You will note in our inbound collective bargaining proposal that we have asked to explore a potential alternative dispute resolution process. We have also asked for the Employer to relinquish its right to lock out its staff. We have heard nothing from the Employer on either of these points. Our ingoing proposal was provided to you in June. We have reached the point where a bridge has been crossed. We are simply and utterly frustrated by the Employers conduct. At the Labour Relations Board and in a much broader arena, it will be proven and made clear where fault lies. However, at this juncture, we simply want to make a deal and we believe that it will be helpful to make that happen in a different context, with a different mechanism that is less adversarial. We have consulted with Quest staff and we are authorized to specifically offer the process of binding arbitration. Both parties would relinquish certain rights under the Labour Relations Code. The staff would relinquish their right to strike. Quest would relinquish its right to lock-out its staff. All outstanding monetary and non-monetary issues would be considered by an Arbitrator and resolved by that arbitrator. Within 14 days the parties would agree to an arbitrator. If we could not agree, the Minister of Labour would appoint one. That arbitrator would impose a collective agreement. The parties would relinquish their rights to ratify. The arbitrator would convene sessions immediately and would impose an agreement on or before October 15th, 2015. Both parties could make oral and/or written presentations to the arbitrator in a manner that they choose as long as rules of reasonableness and relevance were adhered to. Either party could have “witnesses” or experts participate subject to those parameters. We have repeatedly said that we do not want to go on strike but the staff have clearly told us that they will if they have to. Nobody wants to have a picket line where parents and their special needs children might be confronted. We asked for the Government to appoint a mediator. Mr. Simpson has participated but has been unable to effect a settlement. We have spoken to parents and we empathize with the horrific position that they find themselves in. They share our view that a strike or a lock-out are both bad ideas. Strike votes are ongoing and as this matter evolves, it seems to only get uglier and uglier. We want to give you a full and reasonable opportunity to consider this with Ms. Rooke and Ms. Hogan. We would ask, however, that you provide us a response within seven (7) days and no later than end of business day August 20th, 2015. At that point, we have the option of not counting our strike vote ballots at all. If that were the circumstance, it could send a message to all parties that we are prepared to work together and set our differences aside for resolution by a fair and objective third party with labour relations expertise. Quest employees are prepared to stand up and they are not prepared to surrender. However, the Quest staff, like us, are prepared to explore all reasonable and sensible options to bring this matter to a close and attempt to start anew with a view to working together to ensure that Quest prospers and is able to provide its treasured services that are so necessary for special needs students. We continue to await your response to our assertion that Ms. Faith should be reinstated to her position. We continue to be profoundly offended by her termination and by the Employer’s negligence in failing to respond to the shocking behaviour of Mr. Bahl, who has put the school and everyone’s employment at Quest in considerable jeopardy.